Are you aware that your home air ducts can be the cause of your expensive electric bill and can lead to many different health issues and situations? You should get an air duct cleaning on a regular basis by a professional to make sure that your air ducts and vents which return the air are efficiently cleaned while removing any allergens from dust, mold, dirt, micro-organisms, bacteria, mold to more. At Tile & Grout Cleaning League City, we offer a superior air duct cleaning service in which our trained and qualified experts will clean the heating and cooling parts and components of your HVAC system professionally. 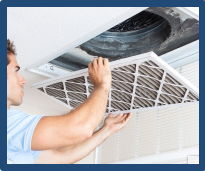 Furnace duct cleaning, heat exchangers, coils, drain pans, fans and motors housing, air handling unit housing and more will be taken care of by our air duct cleaners in League City, TX. Call us for some of the most affordable and professional HVAC cleaning service today and notice the difference. Your AC components can be in risk of contamination even while they are being installed and maintained regularly. Micro bacteria and organism growth is very possible and common in these spots, especially when there is any moisture which in fact comes right out of the EPA. A variety of different allergic reactions to anyone in the house or room and or breathing the air can result from this. Our specialists can tell you that it is very important to clean your air ducts on a yearly basis, if not more. Especially if you have been experiencing any issues or problems in the air quality of your home or commercial space, if any pets are living inside or around, and the different conditions of your area. Don’t be a victim of any health issues occurring from inhaling your dirty air and let our professional duct mold removal cleaners reduce the dirt, dust, and mold from inside of the ducts, reducing the start issues for the air flow. With this reduction, you will not only notice a major improvement in your air flow, but also a decline in your electric bills each month as your system will not be working as much and hard to hit your temperature set.